Coming Up at the NAB – North American Baptists, Inc. The International Office above all exists to serve NAB churches, pastors, and missionaries so they in turn can effectively lead their people joining God on mission. This support is especially key for our missionaries who live in locations all around the world, including Brazil. Missionaries like Lyndell Campbell-Réquia and Brandon and Marci Jones are free to focus on the work before them because of this support. 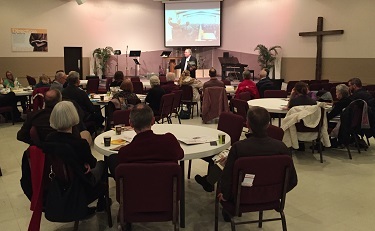 Each year NAB churches all across North America set aside a Sunday before Easter to take a special offering to benefit the Global Missions Fund. Your support of this is key in the continued service of missionaries like Lyndell, Brandon, and Marci.Click here to download bulletin inserts, a promotional graphic, or to help by giving today toward the Spring Missions Offering. The latest edition of Onward is on its way! 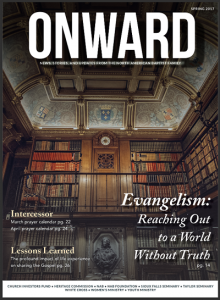 We are excited to let you know that the latest edition of Onward is on its way. 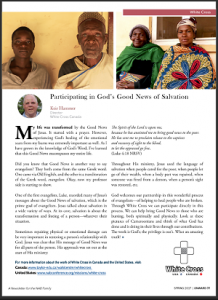 This Spring edition focuses on evangelism. Be encouraged by what is happening around the globe and how to reach out to your community! You can read the digital version here, or email us at communications@nabconf.org to ensure you’re on our mailing list to receive this publication directly. One of NAB’s partnering organizations is White Cross. We are so grateful and blessed by the great work they are doing around the globe, and we are excited to hear that they are putting together a newly updated handbook, which will be a great resource! Click below to check out their latest update or read their latest article in Onward this month by clicking the photo to the right. As you may know, each summer regional ministers and spouses gather for a retreat. This time together is crucial to reconnect, rest, and share what they are learning from God in their role of leading, supporting, and training pastors in NAB regions across North America. This summer, through a very generous and specific gift, something different is in store. The RMs, Executive Team, and Church Investors Fund board are embarking on a cruise together in May for this year’s retreat. This will indeed be a working retreat as the team will be meeting together regularly to discuss our focus in areas like formation, mission, and church planting, and it will actually be saving us money this year. Additionally, executive director, Dan Hamil, will be leading us in spiritual and relational encouragement, Church Investors Fund board will be conducting meetings, and RMs will be having their own separate time together as well. Please pray for this upcoming crucial gathering!